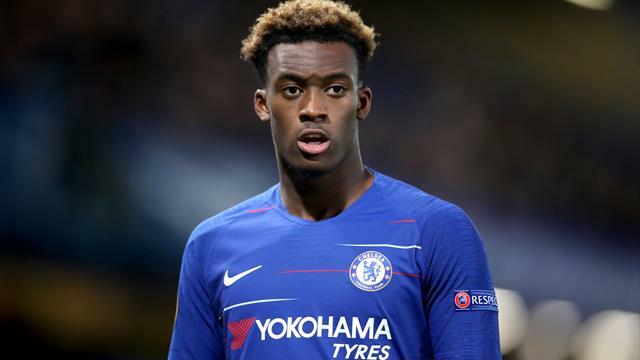 Chelsea head coach Maurizio Sarri has rebuked Bayern Munich for their public pursuit of Callum Hudson-Odoi. The 18-year-old winger, whose contract expires in June 2020, has been linked with a big money move to the Bundesliga giants. Bayern sporting director Hasan Salihamidzic admitted the club’s interest in Hudson-Odoi on Wednesday, much to Chelsea’s annoyance, with the Blues threatening to report the Germans to FIFA if there is any evidence of an illegal approach. Chelsea play Newcastle in the Premier League on Saturday with their transfer business – both incomings an outgoings – making plenty of news. Sarri, who celebrated his 60th birthday on Thursday, is not a fan of the winter transfer window. “It’s crazy to have a market window of 30 days at this moment of the season,” he said. The Italian said he has recommended Chelsea need to recruit two players, but declined to say their positions. He said: “I spoke with the club and the club knows very well my opinion. In my opinion we need two players. It appears obvious, though, that the players Sarri wants are a striker and a midfielder. Sarri is demanding a replacement if Cesc Fabregas’ move to Monaco materialises and, now, also if Alvaro Morata is allowed to leave this month. Sevilla and Atletico Madrid have been linked with the Spain striker. Sarri said: “Of course, if Morata will go to another club we need a replacement. It’s normal. “At the moment Morata is here, so I think he has to think only to play. On Fabregas, Sarri repeated his belief the midfielder should be allowed to go, adding: “I need a replacement, but I don’t need a very important player like Cesc unhappy here. “Willian for us is really very important. So I think it’s impossible to lose him in January,” Sarri said. Ruben Loftus-Cheek (back) is out and Morata (hamstring) is doubtful when the Blues face Newcastle, with Sarri hinting Hudson-Odoi and Andreas Christensen would drop to the substitutes’ bench. Chelsea have failed to score in their last two home games in the league. It was 1993 when they last failed to score in three successive home league games. After Eden Hazard was deployed as a ‘false nine’ in Tuesday’s Carabao Cup semi-final first leg loss to Tottenham, it appears Olivier Giroud is likely to start up front against the Magpies. Sarri said: “We need to solve this problem.